Heat oven to 350°F (325°F for dark or nonstick pans). Grease bottoms only of two 8-inch or 9-inch round cake pans (do not spray with cooking spray). Make cake batter as directed on box. Reserve 1 tablespoon candy sprinkles for decoration. Stir remaining sprinkles into batter. Pour into pans. Bake as directed on box for 8-inch or 9-inch rounds. Cool 10 minutes. Run knife around sides of pans to loosen cakes; remove from pans to cooling racks. Cool completely, about 1 hour. Place 1 cake layer, rounded side down, on serving plate. Spread 1/3 cup frosting over layer. Top with second layer, rounded side up. Frost side and top of cake with remaining frosting. 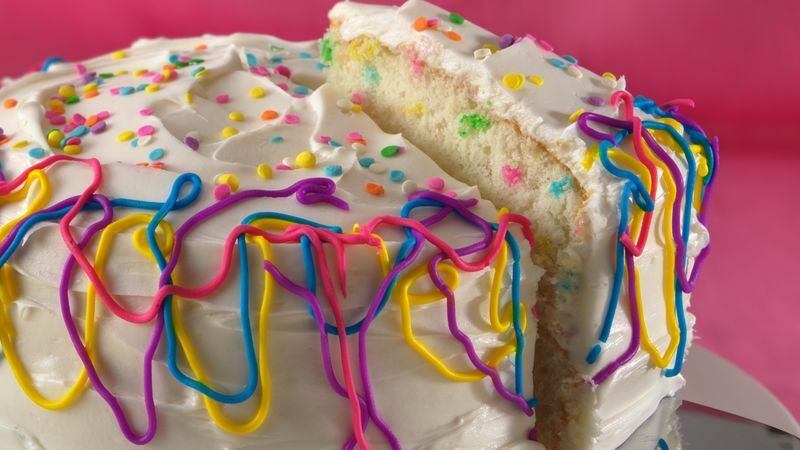 Decorate top edge of cake with decorating icing in random squiggly pattern, overlapping colors. Sprinkle reserved candy sprinkles over top of cake. Store loosely covered. Enclose a sprinkle of brightly colored confetti in your party invitation. Scatter the same confetti on your dining or serving table, too.